have increased, so has the risk that filing a company for an unplanned Chapter 11 could result in dismissal of the case or conversion to Chapter 7. Particularly for middle market companies without the resources and liquidity of large cap companies, it is critical that the treatment fits the patient, lest the patient expire on the operating table. As a result, experienced restructuring professionals must be prepared to counsel clients on non-bankruptcy alternatives to meet client goals. The task of restructuring professionals is made more complex by the influx of private capital into the middle market. In many situations, a middle market company will have both debt and equity on its balance sheet held by the same sponsor and also by third-party lenders and investors. Along with these multiple layers of debt and equity, and multiple stakeholders, come lengthy—and sometimes difficult to penetrate and harmonize—intercreditor agreements and operating agreements. Even if a company could survive a bankruptcy filing if left to its own devices, internecine battles between creditors and investor groups would hamper and jeopardize a reorganization. For these reasons, restructuring professionals advising in the middle market cannot merely be proverbial traffic cops, just advising on the “rules of the road.” Restructuring professionals must also master a client’s capital and operational structures, understand the economics of the enterprise, and then wed this understanding with expertise in the different legal processes available to accomplish client goals. 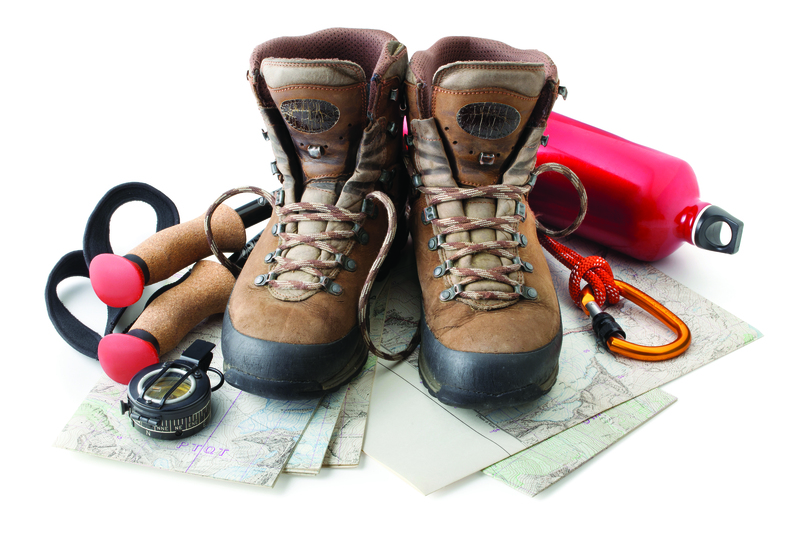 This article reviews certain of the processes, along with their strengths and drawbacks. Bankruptcy is a court-supervised proceeding that occurs in U.S. Bankruptcy Courts. Its substantive and procedural rules are set forth in the U.S. Bankruptcy Code and the Bankruptcy Rules. Generally speaking, Chapter 11 of the Bankruptcy Code governs corporate reorganizations, with the ultimate goal of either a sale of the company under Section 363, or confirmation of a Chapter 11 plan of reorganization or liquidation. In a Chapter 7 case, a trustee is appointed from the outset with the ultimate goal of liquidation in accordance with the relevant provisions of the Bankruptcy Code, which renders this alternative unappealing for many companies for the obvious reasons. Bankruptcy has many advantages. Its automatic stay imposes a national, and sometimes international, moratorium on collection and other actions that allows for a stable operating environment in Chapter 11. Corporate debtors can obtain financing that under certain circumstances can prime pre-existing debt. Under the Bankruptcy Code, debtors can, among other things, compromise claims, abrogate contracts, sell assets free and clear of old liabilities, or implement a Chapter 11 plan for allocating the debtor’s enterprise value among stakeholders and reorganizing the business, all with the aim of providing a fresh start. At the same time, however, bankruptcy imposes reporting and procedural requirements that significantly drive costs. These requirements, along with the hosting of the bankruptcy process in a judicial forum, provide the catalyst for a cottage industry of restructuring professionals to help guide debtors, creditors, and other stakeholders through the process. The restructuring industry consists of incredibly talented and well-rounded individuals, but they come with a cost. Finally, bankruptcy is a public process. For any number of legitimate reasons, clients may wish to conduct their affairs outside the public domain. A traditional bankruptcy process can be effective in the right situations, but when dealing with a company that does not have the capacity to fund a protracted process, has serious concerns about the public nature of a bankruptcy proceeding, or needs a quick turnaround, other options may be a better fit. These include out-of-court workouts, assignments for the benefit of creditors (ABCs), receiverships, and Article 9 sales. In each of these situations, the problems are discrete. To again use a medical metaphor, the patient requires a quick, noninvasive procedure, not major surgery. Bankruptcy, with its attendant costs, scrutiny, and delays, may do more harm than good in these situations, and the company does not need all the tools of a federal bankruptcy process. Bankruptcy excels as a centralized venue for overcoming multiple groups of dissenting stakeholders to effectuate a reorganization. However, when a company need only to deal with a narrow set of parties and incentives can be appropriately aligned, the proverbial hammer of a judicial bankruptcy process may not be necessary. In these situations, a restructuring professional should consider a strategy centered around one or more negotiated resolutions that accomplish a client’s objectives on an out-of-court basis. These can take the form of settlement agreements, restructuring support agreements, forbearance agreements or waivers, loan or contract amendments, separation agreements, reconstituted operational agreements, debt or equity issuances, or any combination of those. Of course, convincing a party to accept something less than what was originally promised is not easy. Many clients in the midst of financial straits adopt an understandably parochial perspective in relation to creditors. Why shouldn’t a creditor (or creditors) accept a compromise, they ask themselves, when everybody ultimately will benefit from the survival and long-term viability of the company? Part of a restructuring professional’s job is to recalibrate this mindset and present the client with the creditor’s perspective. A creditor asks why it should sacrifice when (a) other creditors are not making similar sacrifices (the “free-rider" problem), and (b) it does not have sufficient visibility into the debtor’s affairs to believe with confidence what the debtor is saying. It is from wrapping a client’s challenges in the context of these basic questions that a restructuring professional can understand the viability of an out-of-court solution and develop a strategy for achieving a client’s goals. 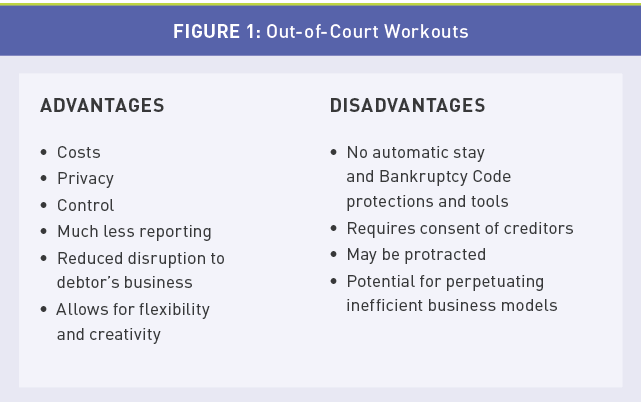 If an out-of-court workout can be achieved, typical advantages include less cost and disruption to the business (Figure 1). It can occur with less visibility that, as already mentioned, can have a positive impact with employees, customers, or suppliers. The difficulty in reaching an out-of-court solution, as already discussed, arises from the fact that it is by definition consensual. Thus, an advisor needs to identify the leverage points and incentives that could coerce creditors to agree to a workout. ABCs and state receiverships are creatures of state, not federal, law. The rules differ by state. Some states have comprehensive statutory schemes, while others lean more heavily on common law and practice. Many states mandate judicial oversight, while others do not require initiation of a court proceeding. In an ABC, the owners execute a trust instrument that assigns the assets of an enterprise to a trust, overseen by a trustee known as the assignee, for purposes of monetizing assets for distribution to creditors. The sale of assets can occur as a going concern or a piecemeal liquidation and, while less common, an assignee can operate a business for a limited period of time to facilitate a sale and maximize value. From that value, trustees/assignees distribute proceeds to creditors through a notice and distribution process similar in many ways to the noticing and filing of proofs of claim in bankruptcy. A state receivership is functionally similar to an ABC, but almost always is initiated through some form of judicial intervention. Because of some distress in a business, and often at the behest of a litigation party, state courts can appoint receivers with broad powers to temporarily manage and often liquidate a business. The scope of a state receiver’s powers typically is set forth through statutes and/or court orders, and these receivers can, and often do, seek court authorization to undertake transactions and other activities in connection with a business. Both ABCs and state receiverships can work well for businesses that have reached the end of their lives and do not have assets and liabilities across multiple states, and for which professionals can assist in an orderly liquidation and winddown. Because assignees and receivers typically are not business operators, these are not always optimal solutions for preserving going concerns. Figure 2 lists advantages and disadvantages of ABCs and state receiverships. 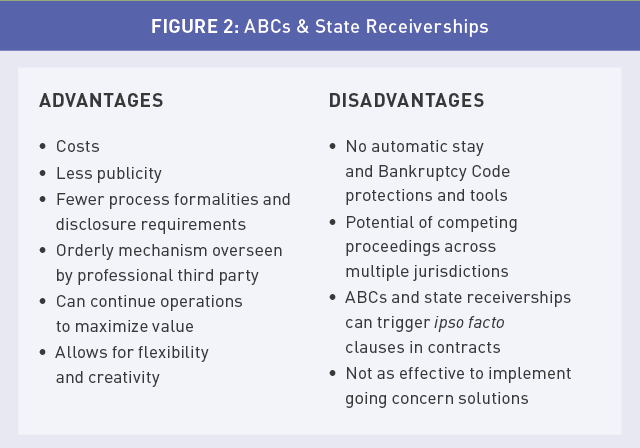 In addition, because of the more limited jurisdictional reach of state courts in comparison to federal courts, the utility of ABCs and receiverships can be more limited for businesses with multistate operations. The reason is that creditors outside the jurisdiction of the ABC or receivership could bring competing collection and enforcement actions, which the assignee or receiver would have to decide whether to defend. These creditors can attack the ABC or receivership in the creditors’ respective home jurisdictions or even in the jurisdiction sponsoring the ABC or receivership. The prospect of competing proceedings across multiple jurisdictions contrasts with the national moratorium and centralized venue enforced through a federal bankruptcy court and the Bankruptcy Code’s automatic stay. Still, these risks can be mitigated by coupling an ABC or receivership with one or more foreclosures under Article 9 of the Uniform Commercial Code (UCC)—which can infuse further legitimacy into an ABC and hence buttress its enforceability in the eyes of a judge—because the UCC, while also a creature of state law, is, as the name suggests, more uniform across states. Federal receiverships are similar to state receiverships but with one significant advantage: the jurisdictional reach of federal courts generally is more robust in comparison to state courts, and judges in both state and federal jurisdictions tend to be more deferential toward a federal receivership proceeding. 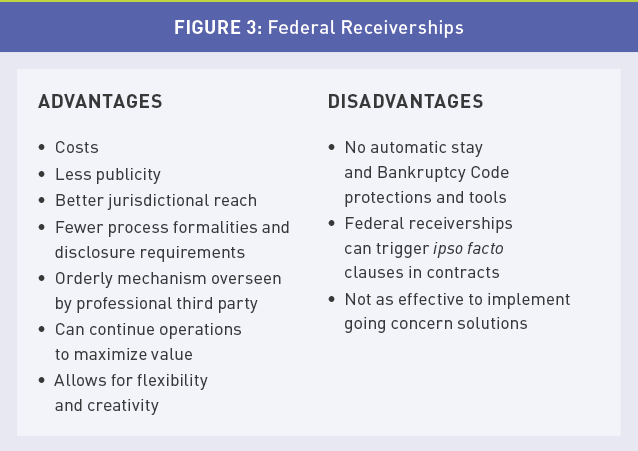 While federal receiverships can have all the benefits of ABCs and state receiverships (Figure 3), it is notable that federal receiverships occur in U.S. District Court, not bankruptcy court. Parties therefore still will need to satisfy the sometimes-higher hurdles for satisfying “subject matter jurisdiction” in federal district courts. In general, to establish subject matter jurisdiction, a petitioning party either must demonstrate “diversity” between the parties or invoke a “federal question” for the federal court to open its doors to the federal receivership. Broadly speaking, to raise a federal question a plaintiff must allege a violation of the U.S. Constitution, federal law, or a treaty to which the United States is a party. For diversity, broadly speaking, a plaintiff must show that the amount in controversy exceeds $75,000 and that the litigants are diverse in citizenship or state of incorporation. Once a party anchors an action in federal subject matter jurisdiction, it can invoke either Federal Rule of Civil Procedure 66 or the district court’s equitable powers in seeking appointment of a receiver. In addition, depending on their applicability, specific civil or criminal statutes may expressly provide for appointment of a receiver under appropriate circumstances. The test for appointing a receiver can vary depending on the facts and circumstances. However, at the risk of overgeneralization, there should be some showing of waste, fraud, gross misfeasance, and/or gross malfeasance as a prerequisite to the nonconsensual appointment of a receiver. Of course, a defendant or other party always can consent to appointment of a receiver, the advantage of which is perhaps having a greater voice in crafting the terms of the receivership. In general, Article 9 of the UCC governs the creation, attachment, and enforcement of personal property liens and security interests. It does not apply to real estate. An Article 9 foreclosure and sale is the process by which a secured lender takes control and sells collateral either to a third party or buys it itself by “bidding” in its debt. The sale can occur either through a public auction process or a private transaction. There are details and variations to the Article 9 process that are well beyond the scope of this article. For purposes of this article, the takeaway is that Article 9 transactions can be an effective tool to transition ownership of assets as a going concern or to liquidate assets piecemeal, where a senior secured lender is taking an active role and a buyer is willing to manage the risk of post-transaction collection claims or other legal activity (Figure 4). While Article 9 foreclosures typically eliminate junior liens on collateral—assuming the parties comply with Article 9’s notice and other requirements—unsecured creditors often argue that their claims are not affected by an Article 9 foreclosure. In this regard, carriers have developed insurance products in recent years to help mitigate post-closing litigation risk. Even when relevant state law mandates a court-supervised process, Article 9 foreclosures and sales often can occur more quickly than bankruptcy sales. Also, in comparison to bankruptcy, the Article 9 noticing and reporting requirements are more limited. The greater speed and less publicity around an Article 9 foreclosure can mitigate operational disruptions and help facilitate ownership and management transitions. This article provides just a snapshot of strategies and restructuring alternatives. One size does not fit all situations, and combinations of different approaches can be used or variations on traditional transaction structures can be developed. Suffice it to say that in the middle market, restructuring professionals truly must think outside the box and customize their strategies to their individual clients. 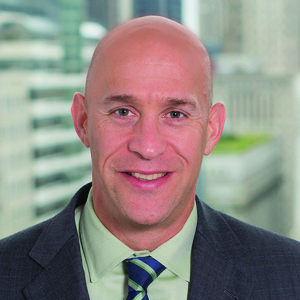 David A. Agay is managing member of the McDonald Hopkins’ Chicago office and a member of the firm’s Board of Directors, and he leads the Business Restructuring Services Group in Chicago. He represents public and private companies, strategic and financial investors, directors, officers, lenders, committees, and shareholders in a variety of distress and nondistress engagements. Agay regularly counsels clients in financing and M&A transactions; Chapter 11 and 7 bankruptcies; cross-border matters; out-of-court exchanges and balance sheet restructurings; and other corporate reorganization and insolvency proceedings. Shara C. Cornell is an associate in McDonald Hopkins’ Business Restructuring Services Department in Chicago. 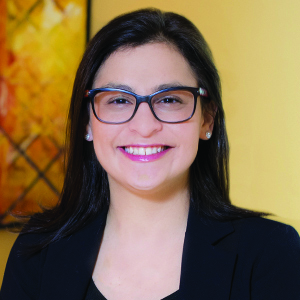 She has six years of experience representing secured and unsecured creditors in restructuring and bankruptcy proceedings, including large Chapter 11s. Cornell served as staff law clerk and law clerk to the Hon. LaShonda A. Hunt and Chief Judge Bruce W. Black (ret.) in U.S. Bankruptcy Court, Northern District of Illinois, and as law clerk for U.S. Bankruptcy Judge Robert G. Mayer (ret. ), Eastern District of Virginia.